Queen guitarist Brian May is set to reveal the results of his mission to uncover the origin of a rare series of 1860s French stereo cards, called Diableries. May (pictured) has co-authored a book called Diableries: Stereoscopic Adventures in Hell and will give a talk about the project at the Royal Institute of British Architects in London on 1 November. The event will mark the Halloween launch of the book, which May has written with photo-historians Denis Pellerin and Paula Fleming. The authors will present a ‘Gothic Victorian underworld of temptation, seduction, retribution and devilish fun brought alive in colour and 3D’, according to the Royal Photographic Society (RPS) which is organising the event. The 280-page book, priced £40, contains 500 photographs and will come with a stereo viewer designed by the musician. 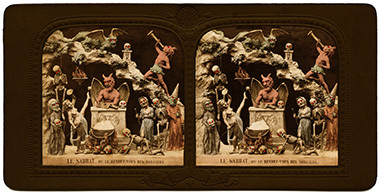 The 3D presentation and lecture will give visitors the chance to learn about the ‘origins and hidden meaning of these rare 1860s French photographs which depict an imaginary underworld populated by devils, satyrs and skeletons’, adds the RPS. In an interview with Amateur Photographer (AP) in 2011, May explained how he was working with French and American researchers to shed light on the origin of Les Diableries. Tissues feature a print on a piece of photographic paper, with colours painted on the back. The viewer only sees colour when the image is held up to the light. Red gels are used for the devils’ eyes. ‘There’s a magical transformation between what appears to be a daylight view… and a night-time view when you hold it up to the light,’ he said. May’s zeal for imaging stretches back to the time he spent in his father’s darkroom. ‘I was lucky enough to have a dad who spent hours and hours with me in the darkroom, developing our own pictures and printing them,’ May told AP’s news editor in 2011. Tickets for the event at the Royal Institute of British Architects, which includes a book signing, cost £15.